The most common cause of sync problems are network issues, and we've added a diagnostics tool so you can identify and solve these issues whenever possible. 1. Go to theAeroFS tray icon and click Help. On the left, the dialog lists the 3 networks AeroFS uses to sync and how many other computers are on each network. 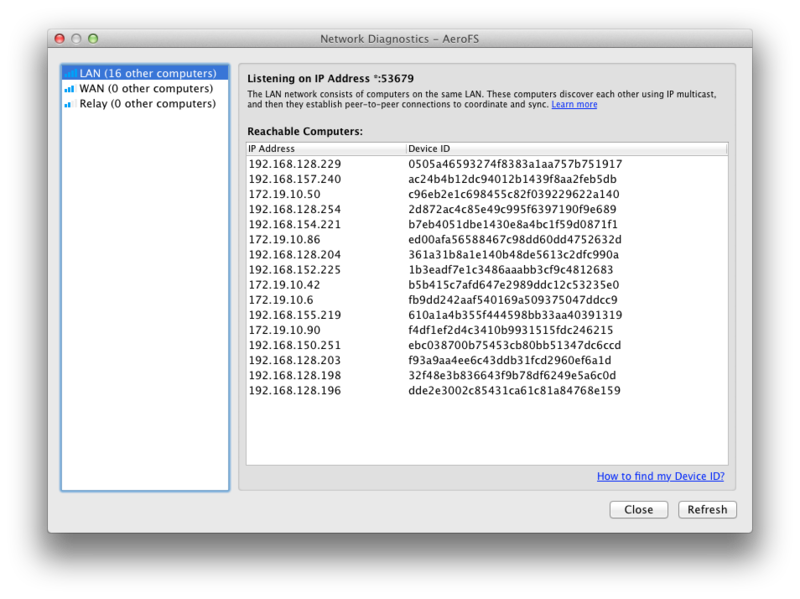 On the right, the dialog lists the details of each of the networks and the associated computers. Notice that instead of the computer name, the Device ID is listed. This is how AeroFS identifies your computer on the network, and here is how to find your Device ID. Mobile devices are not included here, even though they may be connected as well. LAN: AeroFS uses this network to sync files with other computers on the same LAN. AeroFS uses SSMP to discover other computers running AeroFS. These computers establish direct connections over LAN to sync. The dialog shows what port AeroFS is listening on for incoming connections. Relay: AeroFS uses this transport to sync files when direct connection is impossible due to network configurations such as firewall. Data is encrypted on the sender and then sent to the relay, the relay routes the data to the recipient, and then the recipient decrypts the data so the communication is private and secure.